A project at the University of Nebraska-Lincoln is reviving an historic building that opened in 1869 and was demolished in 1948. Starting this week, people will be able to tour it, at least in virtual form. 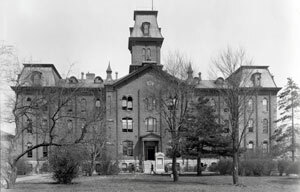 University Hall, the first building ever constructed on campus, was designed to "inspire and awe visitors," as one account put it. But the construction process was "plagued by poor quality materials, cost overruns and negative publicity." Three men died during the building of the hall, when a cable attached to their scaffold snapped. Contractor J.D. Silver, who was pointed to as a negligent party in the deaths, went on to become mayor of Lincoln. The structure underwent multiple foundation replacements, steel rod reinforcements and the eventual removal of the top two floors decades later. This Friday, the campus will celebrate the 150th anniversary of its founding, and as a part of that celebration, people will have opportunities to put on virtual reality headsets and walk around the structure. Eventually, they'll be able to tour the interior as well. The initial VR tour is just the first step in an ambitious effort to develop a virtual version of all of the university's facilities and grounds up to the 1890s, when electrification was added to campus. The VR project is a collaboration between a small group of faculty and NET, the organization that runs Nebraska's PBS and NPR stations. Participants include Chad Davis, assistant general manager for emerging media at NET; Heather Richards-Rissetto, assistant professor of anthropology and a faculty fellow in the Center for Digital Research in the Humanities; Steve Kolbe, associate professor of film and new media; Mike Fields, software development manager; and Patrick Bate, a graphics specialist. "We thought this would be the perfect opportunity to tackle the campus' very first building and bring it back as part of the sesquicentennial," said Davis in an article about the project. "It was also [an] attractive project due to the challenge of bringing back a building very few people know stood on campus." Creation of the VR tour began with a compilation of blueprints and old photos of the structure. That led the trio to Kay Logan-Peters, a professor of libraries and unofficial campus historian. She had written a book that includes 180 historic images of Nebraska U and had led a library team in the creation of an online resource to document the timeline of university buildings up to the mid-1960s. She also knew about a model of the Hall, which had been presented to the university by the class of 1897, and which was being kept by facilities. The VR team used digital single-lens reflex (DSLR) cameras to capture hundreds of photos of the model, which were then stitched together through photogrammetry software to create a digital version of the building. To refine the model, the group will capture images of masonry and woodwork from the same eras as University Hall, to layer onto the exterior of the structure. "Being accurate and getting the details right is part of our PBS ethos," Davis said. "We want the virtual reality version of University Hall to be as realistic as possible based on the data we have available. It's also important to us to show the beauty of what was a much-maligned building." Soon, the tour will be available as a downloadable app that people can view using Google Cardboard and their smartphones.